We all know about the very brutal winter we have been dealing with for the past few months. Relentless bone chilling temperatures, and massive amounts of snow, have many of us screaming "when will it end". 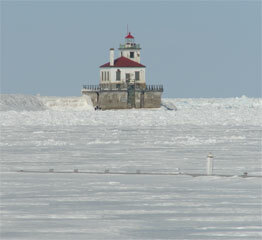 With only about six weeks till our mid April fishing season begins and with the local temperature rising to a balmy 10 degrees above zero, I decided to head to Oswego to check out the lake. What I found was snow, more snow and even more snow. And as you can see above, there is ice, plenty of ice, in fact, there is a hell of a lot of ice. Even for Upstate NY it is an unusual sight. 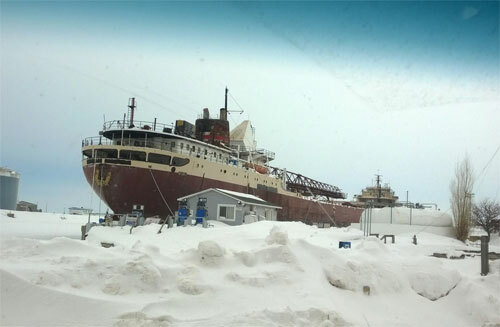 Another unusual sight this year is the huge ship that is moored to the Port Authority pier wall on the East Side of the ice covered Oswego River. 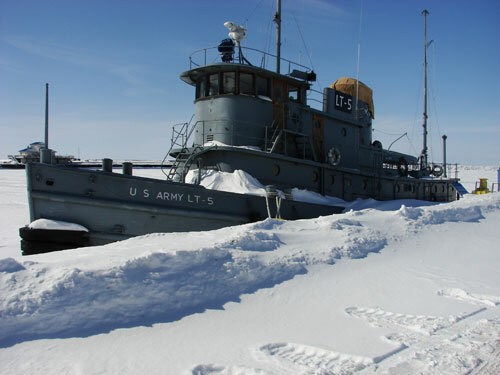 (see first image below) The vessel, the American Fortitude, awaits the spring thaw when it will be towed to a shipyard where it will be cut up for scrap. This 60-year-old 700-foot behemoth is currently totally iced in as it awaits its final voyage. This is the vessel that replaced the infamous Edmond Fitzgerald on the shipping routes carrying cargo to various Great Lake ports. This unusual sight will be gone by spring as the ice and snow give way to spring runoff. Then the American Fortitude will be towed to its demise and we will be able to fish. I hope! Still another unusual happening while fishing on Lake Ontario is the process of landing an Atlantic salmon on a regular basis. I say this because since the stocking program started, catching an Atlantic salmon while trolling is not a common occurrence. While a few are caught, this fish is just not as plentiful as a Chinook, Brown, Steelie, Coho or Laker. 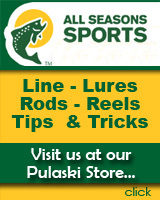 First of all, not as many Atlantics are stocked as are other trout and salmon species. 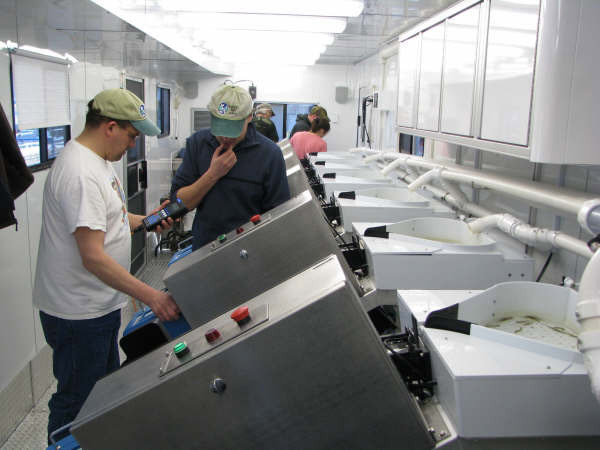 For example, we stock about 1.6 million fingerling Chinooks, as opposed to 200,000 yearling Atlantics. However, after 30 or so years of annual plantings, the Atlantic has not achieved spawning numbers as well as the Chinook. The Chinook now has a confirmed wild fish presence which augments the annual 1.6 million stocking program. The non native Pacific Salmon has become naturalized to the lake while the native Atlantic has not made any real restoration progress even after many years of trying. It seems as though Atlantic restoration efforts have lagged far behind the now naturalized non-native Pacific Salmon. Try as hard as they have, over thirty years of effort has provided poor results at best. I find it interesting that the Native Lake Trout restoration effort has also provided poor results and remains dependent on annual stocking efforts. Many states have officially abandoned their annual Atlantic restoration effort yet the program on Lake Ontario continues with updated plans that, hopefully, will result in better success than in years past. By the way, Atlantic salmon is a native species that makes them highly regarded fish in some people's eyes. It seems that the Atlantic restoration efforts are aimed at landlocked salmon and not the andromous strain that would run from the ocean to Lake Ontario and back. Some believe that landlocks evolved from the ocean strain and adapted to the lake and evolved to their fresh water only preference. In other words, the freshwater lake has become their ocean. Some question whether the landlocked strain is really a native species or whether it evolved from its ocean going ancestors. See how complicated this is? As we begin to stock another missing natural fish, (Cisco) to provide a more nutritious source of food for the Atlantic, it is hoped that this will be the puzzle solving moment that will usher in the return of the wild Atlantic. No one really knows if this effort will produce desired results. Like I stated earlier, 30 years of effort has provided dismal results. Since previous methods have failed perhaps the return of the Cisco will return us to the "Promised Land" of what some would consider the way it was and thus the way it ought to be. Would not adding a sustainable land lock population to the lake be a major success story? Then again, is it possible that it could make things worse as the mix of fish and food will be altered once again? The return to conditions of over 200 years past may not be possible as the natural order of things may have changed and, yes, man would have had a lot to do with it. After all, isn't man part of the natural order? Oh well, all we need is another thirty years to find out. 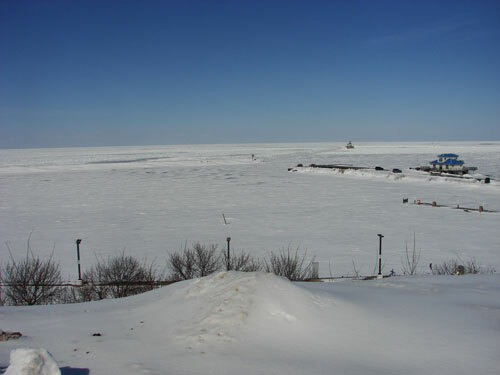 As we move toward the 2015 season, Eastern Lake Ontario should benefit from the cold winter. As we transition from winter to spring I would expect that the lake will warm faster in the east than the west as the ice flow from Lake Erie will add to the cold water flowing from the mighty Niagara River. I would expect that baitfish will seek out the warmer water and the predator fish will follow. 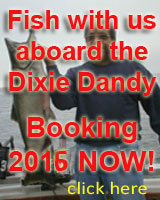 The warmer water will be in the east and fishing should be great. That's been the pattern whenever we have a cold winter with plenty of ice cover. The browns that are there will stay there and salmon will move in to feed on the bait that found its way to warmer water. Unusual sight, not really, it usually happens after a damn cold winter. 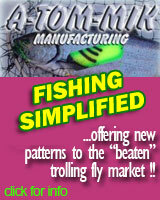 Come fish with the Coldsteel Fleet for a wonderful day on beautiful Lake Ontario. Here is what things currently look like. Only six weeks till we start fishing.